Across the eight floors of this custom designed, high-end department store in one of Instanbul’s premier shopping streets, East meets West in the design, colour and material palette selected by London-based studio HMKM. On the border of Asia and Europe, Istanbul is a city where East and West meet. 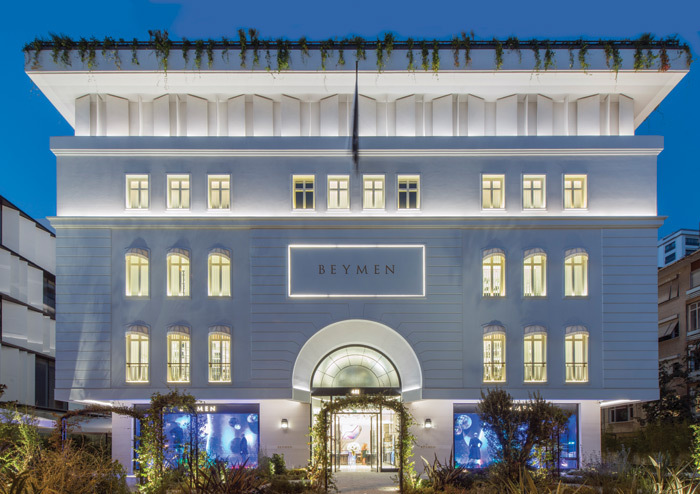 London-based consultancy HMKM used this as an inspiration for its design of Beymen department store on the city’s historical Bagdat Avenue in the Suadiye neighbourhood. HMKM’s brief was to create a unique, standalone building for the high-end retailer on one of Istanbul’s most famous shopping streets. Bagdat Avenue runs for more than 10km parallel to the Sea of Marmara on the Anatolian side of the city. Set 10m back from the pavement like many of its neighbours, the new Beymen building stands in its own modernist landscaped garden. ‘We were also responsible for the internal layout of all eight floors, including vertical and horizontal customer circulation.’ He adds that while the department store opened in September 2017, a further phase of work will include garden-terrace restaurants. With its neoclassical stone facade and the double-height curved alcove entrance, the new building pays homage to the golden age of department store design. But with an area of 5,000 sq m, one of the main challenges for the designers was figuring out how to best encourage customers to circulate and explore the different floors, Greenleaf says. HMKM created a bright central atrium, offering a sense of openness and enabling visitors to glance at the different floors. 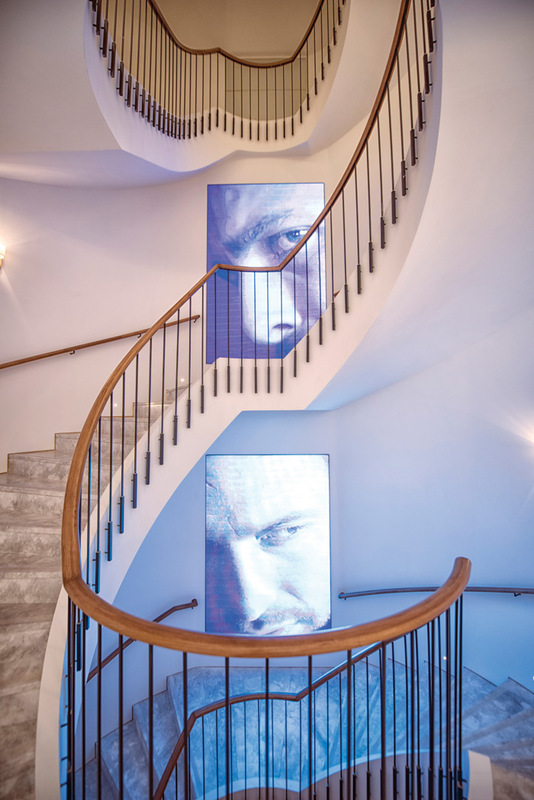 A sweeping marble staircase, lined with digital screens, links the floors. ‘Each floor is its own world, with its own look and feel, linked by a feature spiral staircase at the rear of the store, along with a central, top-lit atrium to visually connect all floors,’ says Greenleaf. The end result is eclectic, guaranteeing plenty of visual delights as visitors make their way from floor to floor. 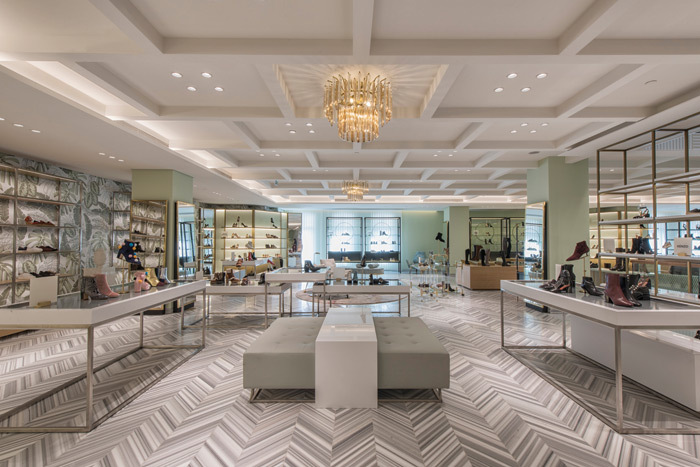 The ground floor is devoted to beauty products and jewellery, and features an intricate mosaic-tiled floor, geometric mirrors and screens, plus marble, suede and glittering chandeliers. Women’s bags and accessories are on the light-filled first floor, lined with dusty rose-coloured walls, chevron-patterned floors and contrasting bespoke rugs. The second floor is given over to women’s shoes, and here the main colour is mint green, in walls and furniture. Products are displayed on interlocking, geometric-shaped display units. The third floor – for women’s designer and evening wear – features timber floors and elegant lighting, while the fourth floor for daywear features bright oranges and reds, with leopard-print rugs and wood-block cladding. Meanwhile, menswear is on the lower floors. Here graphic flooring and wood-panelled walls feature alongside original touches, including a vintage-feel pool table and gold-coloured metal palm trees. The roof level, with whitewashed walls and oak strip floors, is taken up by the home department, which leads to a roof terrace offering panoramic views of the nine Princes’ Islands in the Sea of Marmara. Specifically designed for Beymen, the striking luxury interiors and exteriors make the new store a standout in Istanbul’s bustling shopping scene, Greenleaf adds.